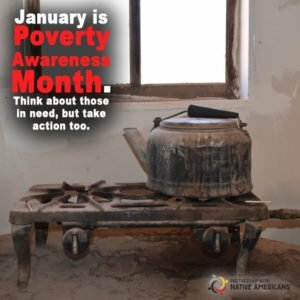 January is Poverty Awareness Month, a time when individuals, charities, and large organizations can reexamine their commitment to helping those in need. There are roughly 40.6 million people living in poverty in the United States, and Native Americans tend to be over-represented within this population. In fact, 35 percent of Native American children live in impoverishment. Additionally, 40 percent of Native Americans live in sub-standard or overcrowded housing, and 23 percent of Native families live with food insecurity. Partnership with Native Americans (PWNA) is committed on a year-round basis to respecting and supporting the self-determined goals set by Native American tribes, and one of the ways they do this is by partnering with reservation-based programs that are tackling the issues that stem from poverty, such as food shortages, healthy diets to improve quality of life, education and even the lack of emergency response such as fire and EMT services. Poverty doesn’t only disrupt lives but creates inter-generational issues that perpetuate through families, which makes this work incredibly important. Food insecurity linked to poverty contributes to health issues such as diabetes and obesity, as many of the most readily available and affordable foods tend to be lacking in nutritional value. This is especially true in remote reservation communities where convenience stores are more prevalent than grocers. Poverty among children can contribute to missing school, or under-performing in the classroom due to hunger and stress. These educational impacts are multiplied across Native communities, eroding quality of life and healthy futures. PWNA’s long-term vision focuses on eradicating poverty and its attendant issues by providing aid for over 250,000 Native Americans each year. By supporting immediate impact through meals for Elders and families, school supplies for children, support for health partners and emergency needs, as well as resources for long-term solutions such as community gardens, garden training, scholarships and professional development, PWNA is fueling sustainable gains for generations to come. This entry was posted in Humanitarian and tagged food insecurity, future generations, Native American, poverty, Poverty Awareness Month. Bookmark the permalink. Trackbacks are closed, but you can post a comment.